Heat oil and add the ingredients for the seasoning followed by the onions. Sauté onions till transparent. 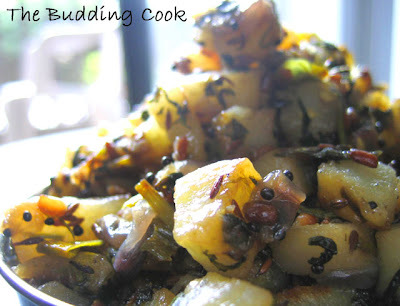 Add the frozen methi cubes and cover and cook for 2-3 minutes till the methi thaws in the pan. (I don’t thaw it separately.) Mix well and add the chilli powder. Potatoes in any form is something I like...the addition of methi sounds interesting. I've wanted to try this popular combination but always make it with spinach instead... so no need to boil potatoes before hand? That's neat and i guess they don't get smushed that way. This is one of my favo sabzi and cant eat it endlessly without getting bored of it. I realised I did not post this recipe after seeing urs... I will do that soon!